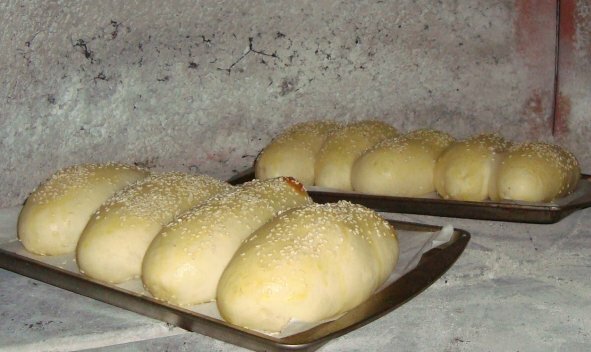 Today I fired up my wfo oven to make pizza and this morning I made the recipe for my 'Sandwich Buns'. I needed hot dog buns for Mondays cookout and since the wfo was hot I retarded the shaped hot dog buns in the refrigerator until tonight when the oven had reached a temperature of apx. 400F and falling. I removed them for about one hour to finish proofing and placed them into the wfo for 20 minutes to bake. I wanted to get them into the oven right away because they had proofed a little more than I wanted, so as I brushed them with an egg yolk glaze and asked my husband to sprinkle on the seeds..I think he actually enjoyed it and I enjoyed watching him enjoying it ;) I will post a crumb shot later. Ready for tomorrows hot dogs...I haven't had a hot in ages and looking forward to toasting these on the grill! I hope the hot dogs are up to the buns! Those are great looking Sylvia, and I'm really impressed with the even coloration you got in your wfo. 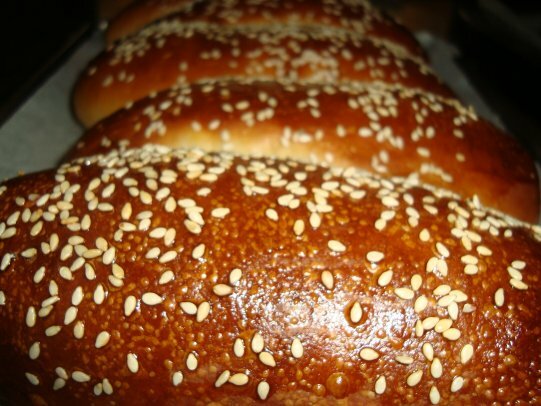 I usually make my hot dog buns using brioche dough (it's what we use at work), and though they've got lovely flavor (what wouldn't given the amount of butter), I think for my next home bake I'll adapt your sandwich bun recipe which I am absolutely in love with for hamburgers, roast beef, etc. I'm so glad you enjoy the buns as much as we do. 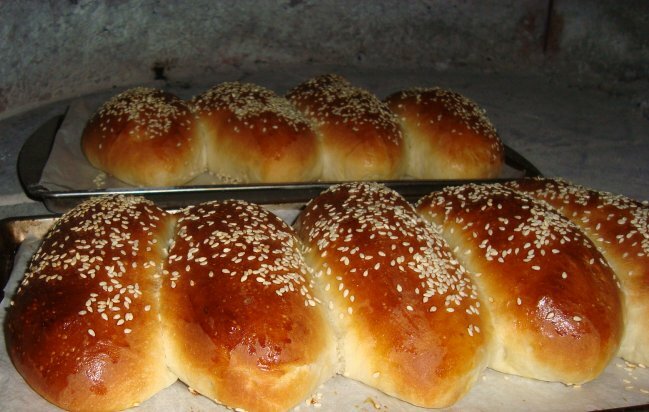 They are nice because of the amount of butter in them and pull apart in stretchy flakes and even better the the next day, like most breads. These photos were taken in a pitch black oven at night. I have an outlet nearby and just keep forgetting to pick up a lamp at the hardware store. It would make things easier than using a flashlight. I tried something a little different because I wanted the oven to cool down quicker from having it fully heated for my pizzas. The pizza's were perfect...I've got that part of the oven down just right. I left the door off, before the buns in, to cool it down quicker, I wanted to get to bed earlier. It affected the floor causing it loose more heat than I wanted...probably from the cool night air entering across it, the buns would have browned more on the bottom had I left the door on while it was cooling. I did learn something about my ovens heat stabilization. I rotate the pans to get even browning. They have added flavor because of the long proof in the refrigerator...do try this! These were a little overproofed after taking them out of the frig. for over an hour. They will be very nice when toasted and filled with hot dog fixings. I don't eat hot dogs but maybe a couple of times a year. I like the Hebrew National Kosher brand...any other suggestions are welcome! Here in the DC area we have a small company that makes a variety of wonderful sausages, all with natural casings: Simply Sausage. Easy for me, not so easy for you. I'll be heading up to King Arthur mid-June to take a 2-day course with Dan Wing on wfo's. I'm really excited and hope to be able to come back with some knowledge to share. I think I know what that is.. I do love good sausage occasionally. I'm looking forward to hearing about your wfo course..hope to see some photos too! I am like you Sylvia, I do not eat hotdogs very often but sometimes I just crave a good hot dog. I am always disappointed in the commercial buns though. Yours look great and I am sure they taste great also. I have never made them from scratch but I may have to now! I recently did a taste test of several hotdog brands and the concensus is "Nathan's" taste the best but I do not know if it is available in your neck of the woods. Hi Don and Thank you. Wow a taste test of hot dogs..that had to be fun. If I'm eating a hot dog I want it to be great! I'll look for "Nathan's". How nice to be able to make your own hot dogs from scratch..especially curing your own meat...at least you would know for sure what went into the makings..sounds like to much work for me. I don't eat that many hot dogs but would love a home made one.